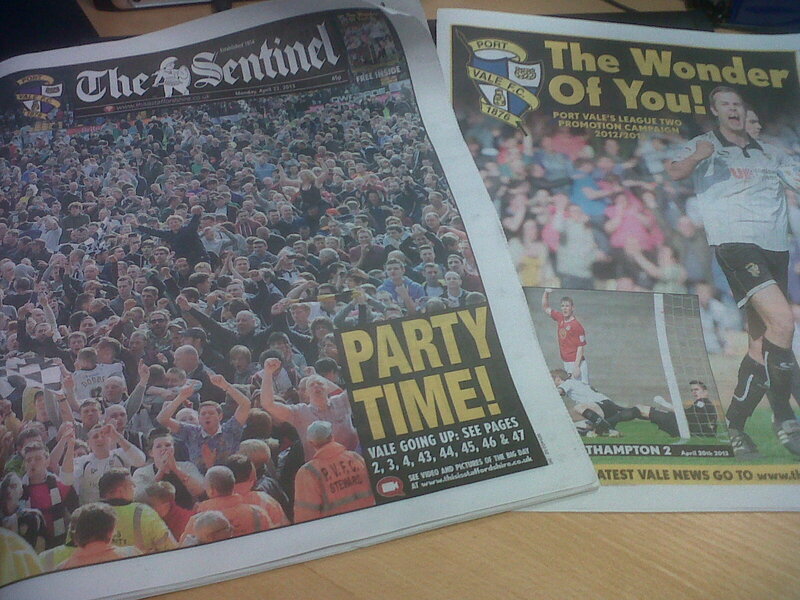 Views about on and off-the-field matters at my beloved Vale Park published every Friday in The Sentinel newspaper during the season. 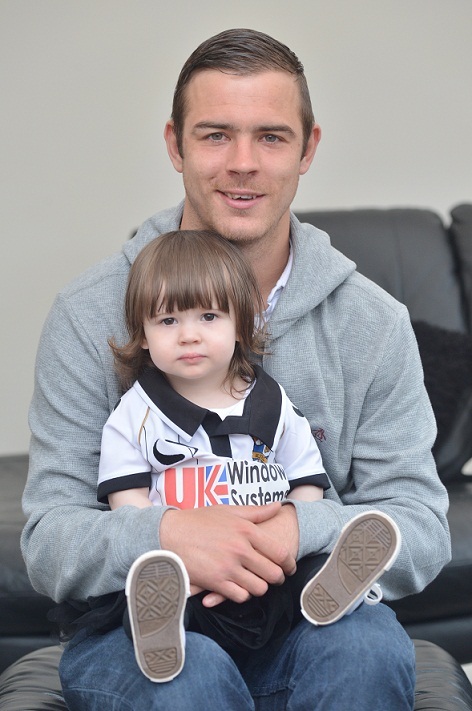 Tom Pope with his daughter Mollie-Mae. It’s where Tom Pope, his brother, and his mates would spend hours kicking a ball about like any young lads the length and breadth of the country. By his own admission, there was nothing at that stage to indicate he would go on to become an icon at the club he has supported since he was a boy – one of only two Vale players since the war to score more than 30 goals in a season. Tom, a former pupil of Sneyd Green Primary and Holden Lane High School, said: “If you’d have asked any young lads back then I guess loads of them would have wanted to become footballers. Born into a Vale-supporting family, young Tom was taken to home games by his grandfather and stood in the Lorne Street. “I’d have been about five when I first started going,” he said. “Dad wouldn’t let me go in The Paddock because he didn’t think it was for children so I spent my first few seasons kicking a can about in the Lorne Street. “My dad went on the buses to every Vale away game for about 15 years I think and he only stopped to come and see me when I was playing for Crewe. “My fondest memories as a Vale fan are of the early to mid-nineties and the team John Rudge put together – the likes of Martin Foyle, Neil Aspin, Dean Glover, Ian Bogie and Bernie Slaven etc. “I guess players like Neil Aspin will always have a special place in the hearts of Vale fans. I used to love his mazy runs from the edge of his own penalty area which never amounted to anything. He would have run through walls for the Vale. Despite his love of the Vale it was Crewe Alexandra’s highly-acclaimed youth set up which nurtured young Tom’s skills between the ages of six and 13. He wasn’t, however, offered a contract by the Alex and so turned his hand to window-fitting while playing for Biddulph Victoria. It was his performances (and goals) in the Midland Football Alliance which finally persuaded Crewe boss Dario Gradi to sign him. Tom turned pro in 2005 at the age of 19 after two unsuccessful trials with, you’ve guessed it… Port Vale. He spent four years with the Alex and was the club’s top scorer with 10 goals from just 17 starts during the 2008/9 season. That season, however, Crewe were relegated from League One and Tom signed for League Two rivals Rotherham for a then joint club record fee of £150,000. His time in Yorkshire wasn’t a particularly happy one and goals were few and far between. He missed out on a trip to Wembley because of a broken metatarsal and when he returned to fitness found himself behind Adam Le Fondre and Ryan Taylor in the pecking order. By his second season with the Millers the then Rotherham boss Ronnie Moore was quite prepared to sell Tom to the highest bidder as he hadn’t been scoring regularly. Several clubs expressed an interest but it was Jim Gannon who tempted Pope to Vale Park. “It was about the only thing Gannon did right, wasn’t it?” I ask. In August 2011 Tom joined the Vale on a free transfer, having been released by Rotherham. He said: “There were five or six clubs interested in me at that time and Vale’s offer was by far the lowest on the table, to be honest. I took a huge pay-cut. I’m not just talking a few hundred quid either. But there’s more to your career than just money. He played 45 games last season but scored just five goals as Marc Richards went on to become Vale’s leading scorer for a fifth season running. Tom said: “We were a different team last year. We didn’t really have any wide players to speak of. Lewis Haldane was out injured and Rob Taylor kept having little niggles. “All our play came through the middle of the park and when you’re a bloke who likes to get on the end of crosses there wasn’t much in the way of service for me. So what’s been the difference this season? Why is Tom Pope, at the age of 27, now breaking records and picking up awards? He said: “Believe it or not this summer was my first pre-season in a while when I’ve been able to train properly. “I would go running round Forest Park and up to Bradeley and I felt good. Of course, Vale started the season in administration and there were no guarantees there would even be a club in 2013. It was a worrying time for fans but also for the club’s staff and players who – at one time – went unpaid. Tom said: “It was extremely difficult for us all. We could see and hear what was going on and I think it was obvious that the club needed a new board and a change of direction. “Of course, as employees, you can’t speak out. You’ve got a job to do and you just have to get on with it – no matter what you think. “Thankfully, we had a great set of lads in the dressing room and in Micky Adams we had a strong leader to hold everyone together and I think he deserves enormous credit for that. “Do I think the supporters were right to campaign for change? Yes I think they were. We’ve got a good set of fans and they usually know when something’s not right. This season’s heroics have seen Tom, nicknamed The Pontiff and The Sneyd Green Sniper by the Vale Park faithful, named League Two Player of the Year – among other accolades. Barring a barren spell around March-time he’s been prolific all season and his goals are effectively Vale’s goal difference of plus 30-something. He said: “It makes such a difference for a striker like myself having good, creative wide players in the side. “Jeno (Jennison Myrie-Williams) and Ashley Vincent will always cause problems for defences because of their trickery and pace. Does he think players in the current squad could step up to the level required to survive and thrive in League One? Whats it like to be a Vale fan, though, playing for the club you love and scoring goals? He said: “To be honest I try to keep my feet on the ground. I know I’m very lucky but I don’t tend to get carried away. “Of course I can hear the supporters – I used to be one of them shouting for Foyley and the like – so I know what that’s all about. “It’s hard to believe they are shouting for me, to be honest, and I try to block it out and concentrate on my game. I know it’s special for me but now isn’t the time to start thinking about records and awards and personal targets. “I’m not someone who thrives on praise. If I score a hat-trick then the manager will shake my hand and that’ll do. What about the future, then, for a bloke who is enjoying the form of his life while juggling the responsibilities of being a dad? “I’ve said before I’d like to see out my career here. I’ve probably got four or five good years left and I love the place. “The new owners made me an offer which was respectful and it ties me to Vale for another two seasons. I’d love to think I could stay beyond that too and score a lot more goals. “Let’s put it this way – it would take an offer of silly money to tempt me away at this stage and, if that were to happen, then I’d obviously have to think about my family and see what’s right for us. Vale midfielder Sam Morsy has been offered a new two-year deal. The release of the retained list a few days after the final game of the season is always a bittersweet moment. Irrespective of the team’s achievements, there are sure to be half a dozen players moving on from Vale Park and it is worth reflecting briefly on their contribution. I wasn’t surprised that manager Micky Adams had decided not to offer new deals to Darren Purse, Clayton McDonald, Kingsley James and Calvin Andrew. However, they should all be thanked for the part they played in helping the Vale to achieve a remarkable promotion to League One. If anything, I was a little surprised that a couple more players weren’t released. However, we should bear in mind that Micky Adams has to tread that fine line between shaping a squad capable of competing at a higher level while somehow retaining the integrity, harmony and spirit of a promotion-winning dressing room. He also, of course, has to weigh up which players from the season that has just ended would make decent squad players – providing cover for certain positions. We may find it difficult to keep hold of left back Dan Jones, given that a number of other clubs have shown an interest in him. In addition, some of those offered new deals may decide to try their luck somewhere else and so the four that have gone may well become six or eight in the coming weeks. So where do Vale need to strengthen? For me, it is vital that we bring in a quick, strong centre half – preferably two – as our defence has at times been exposed for pace. If Dan Jones were to go then a specialist left back would also be a priority for me – even if Doug Loft, Rob Taylor and Adam Yates are capable of being the square pegs in that round hole. In the centre of the park, I was delighted to hear that Sam Morsy (who I rate) had been offered a new deal and I hope he chooses to stay. However, I think we need a playmaker – someone able to spray the ball around and deliver that killer pass for the strikers or wingers to latch on to. Up front, we have plenty of options with the Pontiff, the evergreen Lee Hughes, Ben Williamson and Louis Dodds. However, given Hughes’s age, and the fact that both Dodds and Williamson are often used as midfielders or even as makeshift wingers, I’d be tempted to bring in another striker – preferably one with with a bit of pace. Every Vale fan will have his or her opinion on what we need, but how nice it is to be able to sit here with the summer ahead of us awaiting the announcement of new arrivals. 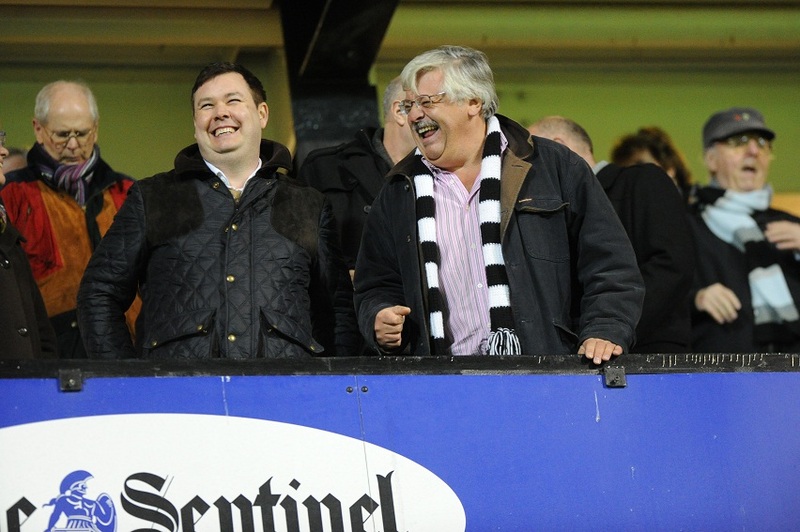 Paul Wildes and Norman Smurthwaite. Stability. That’s what I want now. I’d give anything for a lengthy period of stability and continuity. What has been achieved at Port Vale in the last 12 months is nothing short of exceptional. 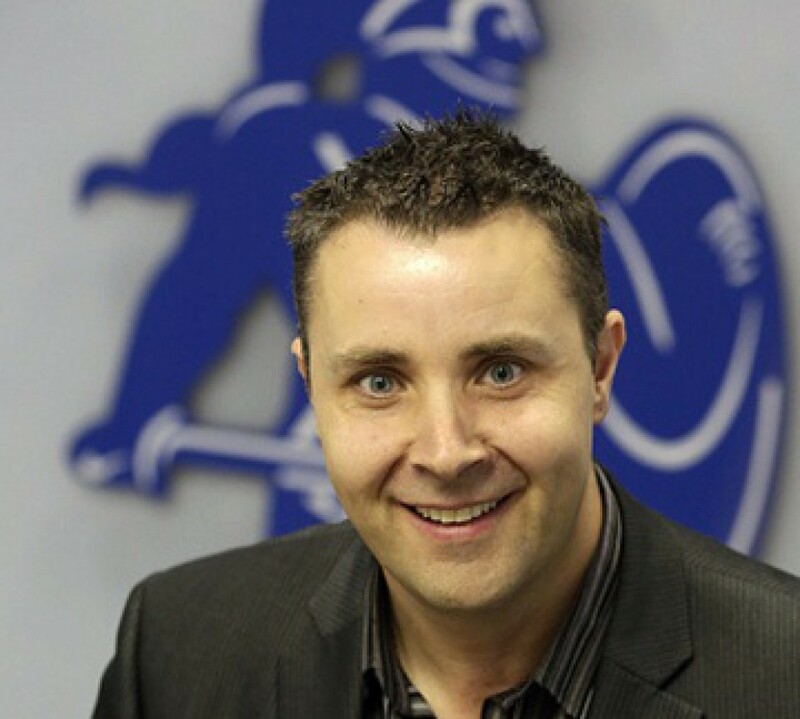 The new owners, Micky Adams, his playing staff and the club’s long-suffering supporters deserve huge credit. This remarkable promotion, which will be confirmed tomorrow, has given us all a huge lift and everyone connected with the club is understandably buzzing. The announcement of season ticket prices has seen queues forming once again at Vale Park as we all look forward to an exciting summer. We’ll all have opinions on who should stay and who should go, in terms of the playing staff, but first and foremost I’d like to pay tribute to everyone who has played a part in our success this season. That includes the talented Ryan Burge, who has moved on to pastures new, Clayton McDonald, Gaz Owen and every player whose contribution has helped us secure a League One position. When the Vale do line up for the first game of the new season at a higher level I’d like to think the squad won’t look vastly different to the one which took us up. Yes, in my opinion, we need two quick centre halves and a playmaker – among other signings. However, I would certainly hope the likes of Tom Pope, Jennison Myrie-Williams, Ashley Vincent, Louis Dodds, Chris Neal, Dan Jones, Adam Yates, Lee Hughes, Ben Williamson and Doug Loft will remain at Vale Park – and not leave, be released or snapped up by other clubs. I think a healthy amount of continuity within the dressing room will be important because it means that same spirit which saw us over the line can be nurtured further by Micky Adams. When you look at the most successful clubs in the sport, stability and continuity is at the heart of everything. Continuity of leadership. Stability of ownership. Continuity in terms of the coaching staff. Stability in terms of the spine of the team. I’ve been hugely impressed with the way the new owners have gone about their business thus far. They seem to have a winning formula and I hope their unique partnership – which has won over fans on a number of levels – can continue for many years to come. No-one knows what next season will bring but at least we won’t be worrying about not having a football club to support. Adam Yates, Tom Pope and Lee Hughes show their passion. These are the moments you live for as a football fan. The reason that people care so much. There will be tension tomorrow. There may well be tears before bedtime: Hopefully tears of joy. But above all there will be a passion built of a momentum that has been growing since that opening day victory against Barnet. So much hinges on this game: If the Burton game was huge then this is colossal. A victory would almost certainly see us promoted given our astonishing goal difference. That achievement would surely rank among English football’s greatest comebacks – a testament to Port Vale’s fans, its players, the coaching staff and the club’s new owners. I can say now that there was a moment, a couple of days before Vale went into administration, when I honestly didn’t know whether or not we’d have a football club to support in 2013. I wondered if perhaps in forcing out the discredited board of directors who had brought the Vale to its knees we had also doomed the club. That’s how close we came to oblivion. It was, in some respects, a huge gamble but one that many of us felt was essential in order for Vale to have any kind of future. As a result our club started the season in administration – with players and staff going unpaid for a time. Indeed, some players turned their back on Port Vale precisely because its survival and, therefore, their financial future could not be guaranteed. I remember supporters turning up to clean the stadium, do some painting and prepare Vale Park for the new season. I recall the bucket collections, the sale of t-shirts and mugs by the Supporters’ Club and the umpteen meetings to try to help the Vale in any way possible. I will never forget the pride felt by so many on the day the Sproson statue was finally unveiled. Amid all the furore Micky Adams, his staff and players have been quietly going about their business. Against the odds, with a small budget at the beginning of the season, they have somehow battled their way into the promotion places and now history awaits. They deserve enormous credit for their performances thus far and all we ask is that tomorrow, once again, they make us proud. One more big performance, perhaps blessed with a goal or two from the Sneyd Green Pontiff, will be the icing on the cake of a fabulous season. Crunch time poll: Do you think Vale will go straight up? In all honesty I would have taken four points from the last two games. However, after the euphoria of Friday night’s unforgettable 7 – 1 drubbing of promotion rivals Burton, I got my hopes up for the Aldershot game and saw us taking all six. As it turned out the atmosphere on Tuesday was tense, the performance forgettable for the most part, and the officials indescribably awful. I’m just about getting over the feeling of deflation as I left the ground. It was the classic banana skin and a draw was probably a fair result in terms of chances created – albeit the visitors were gifted their goal by dint of the fact that the linesman and referee failed to spot Darren Purse being shoved to the ground. They say it’s swings and roundabouts when it comes to decisions going for and against you during the season. On that basis, after 90 minutes of Tom Pope being climbed all over and the referee giving the visitors everything and tolerating their play-acting, I’d say Vale are due a few. With hindsight, it was more important that we beat Burton as that game was the proverbial six-pointer. We’ve been fortunate in recent weeks that results have gone for us and that’s why we have a five-point cushion. But there can be no complacency. A win tomorrow away to a team that have nowt but pride to play for could seal a remarkable promotion. Vale’s terrific, noisy away following will probably be similar in number to Rochdale’s home support and that could well set the lads up for a famous result. We’re unbeaten in five and with the Pontiff, Lee Hughes and Jennison Myrie-Williams in the team I’d like to think there’s enough firepower to see us over the line. As anyone who follows Vale knows, we seldom do things the easy way and they team historically has a habit of putting supporters through the mill emotionally. This season has been no exception but we just need to hold our nerve, stick together and finish the job. If we do and Vale go up automatically to League One it will be genuine Roy of the Rovers stuff. Think about it: A club that started the season penniless and in administration and was rescued by its supporters is fired to promotion by a life-long Vale fan from Sneyd Green. We’ll be dancing on the streets of Burslem.